If you choose to spend your gap year with Aardvark Israel there are a number of programs to choose from. One of which is the International Program. The program will take you to eight different countries and give you the chance to enjoy some incredible experiences. One of the trips is to Ethiopia where you will have the opportunity to meet and learn about the last remaining Jews in the country. As many of you will know, the reason they are the last is because the vast majority of Ethiopian Jews immigrated to Israel in two large waves, during Operation Moses in 1984 and Operation Solomon in 1991. Despite this there is still a functioning Jewish community in Ethiopia and a fascinating heritage to learn about. During the trip you will visit the Jewish communities in Gondar and Addis Ababa. In addition to the wonderful cultural differences that you will witness, the visit is particularly interesting as the Israeli Government does not recognise the communities as Jews. However, to any observer they are a fairly religious group, they will talk to you in Hebrew, they regularly attend synagogue, the women dress modestly, the men wear head coverings and so on. The root of many issues surrounding Ethiopian Jews relates to the sects that they are from and which of these are recognised as Jewish by Israel. The majority of Jews left in Ethiopia belong to Falash Mura, a segment of the Beta Israel community who converted to Christianity when under pressure in the 19th and 20th centuries. 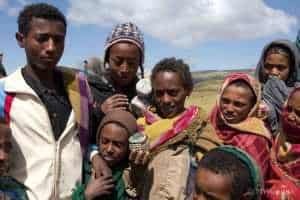 To this day the status of those left in Ethiopia is a sensitive political topic in Israel which regularly comes up for debate and as recently as November 2015 there were reports that the government is set to approve a final wave of Ethiopian Aliyah to allow these people to come. As well as learning about the modern day challenges facing the community you will also learn about the history of Ethiopian Jews and how they trace their history back to the Queen of Sheba and King Solomon. The community has an incredibly rich Jewish culture full of their own legends, such as the presence of the Ark of the Covenant in Ethiopia after King Solomon gifted it to his son Menlik the 1st. Of course while visiting Ethiopia you will also get to enjoy much of the country’s own culture, music, food and dance. However, in many instances you will find that it is very closely connected to the history of the Jews in Ethiopia. On your trip to the old royal palaces it is impossible not to notice the vast number of Stars of David used as decorations. The chance to meet this unique and colourful community of Jews is truly fascinating and something that most people will never have the opportunity to do. It is a wonderful experience to learn about the history and culture of Ethiopian Jews and at the same time gain a unique insight into the issues they face in modern day Israel.